The Ford Expedition is a capable all-around performer thanks to its civilized driving manners, comfortable seating and large passenger and cargo capacities. Ford has updated the Expedition's features list with a programmable MyKey, new services to the Sync system and standard trailer sway control. 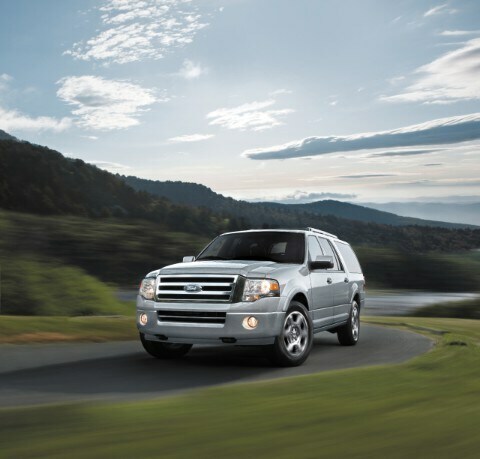 The Expedition line-up comes standard with a 6-speed automatic transmission with manual-shift capability. The alert 6-speed automatic transmission is always in the right gear. The Ford Expedition is available with just one engine on all trim levels, a 5.4-liter V-8 making 310-horsepower and 365-pound-feet of torque. The engine allows for impressive acceleration and the Expedition has sufficient power for any situation. The Ford Expedition's seats offer excellent support, with improved contours, big side bolsters, soft cushions and upgraded materials. Additionally, seat-track travel for the driver's side can accommodate people from 4'11" to 6'4" tall. Driver and passengers will enjoy tone-on-tone leather, attractive and legible instrumentation, a stylish center stack on the instrument panel and cup holders. The most prominent alteration is the nose job, where Ford's now-signature four-bar grille sits front and center. The optional backup camera for the Ford Expedition is most recommended to make visibility easier for the driver, which is helpful when backing up. If you would like to know more about the Ford Expedition, give us a call today!